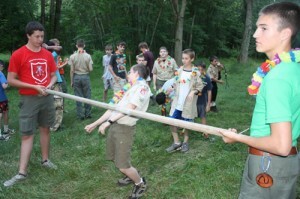 Ingersoll Scout Reservation (ISR) is the primary resident camp of the W.D. Boyce Council of the Boy Scouts of America. Located just west of London Mills, Illinois, the reservation encompasses almost 1000 acres of woodland and prairie between Fulton and Knox Counties. The Cedar Creek, a tributary of the Spoon River, forms most of the southern boundary of the camp. Initially founded as Wilderness Camp in 1963, the camp was renamed in 1973 to posthumously honor William P. Ingersoll, a local philanthropist who helped in the camp’s initial purchase. Ingersoll straddles Fulton and Knox Counties, meaning that the Knox portion of the camp actually lies outside of the W.D. Boyce Council. Some of the roads in camp, mostly those built prior to the camp’s establishment, follow this county line. Camp roads are mostly unpaved and one-lane, winding around the camp as topography allows. Illinois Route 116 curves around the camp after crossing the Spoon River at London Mills. Route 116 is the camp’s primary means of access. For camping purposes, Ingersoll is often divided into two parts: “Main Camp,” which consists of the developed area west of Lake Roberts used for most camp programs; and the “East Side,” the large undeveloped area east of Lake Roberts with minimal road and trail access used primarily for hiking. The 14-mile Cedar Creek Trail follows the periphery of the entire camp. The numerous small creeks and gullies emptying into Cedar Creek on the southern edge of Ingersoll gives the camp unusually varied topography for the area. This is most visible at “Dining Hall Hill,” a main thoroughfare of the camp, which is located on a long incline overlooking the broad Cedar Creek Valley. One minor tributary of the Cedar Creek was dammed in 1963, forming 17-acre Lake Roberts. The camp has another “lake” in the far East Side, Lake McCutcheon, which is actually a small pond fed by the periodic flooding of the Cedar Creek. Forests at Ingersoll tend to be of relatively young growth, as much of the reservation was formerly farmland. There are notable exceptions to this, especially along the Cedar Creek, where enormous trees have been left undisturbed. The soil of Ingersoll consists largely of loess from the Illinoian glaciation. The reservation is home to many native Illinois wildlife species, including white-tailed deer, raccoons, wild turkey, foxes, and coyotes. Beavers have also been known to make their homes on the Cedar Creek, though they are rarely sighted. The entire camp is designated as a wildlife preservation area by the state of Illinois. In less-developed regions of the camp, native prairie grasses have been allowed to grow, creating a habitat for many native plants. The dining hall is the center of resident camp activities. It includes indoor and outdoor seating, a kitchen, and an adjacent commissary building. Troops have the option of eating at the dining hall or preparing food picked up from the commissary in their own campsites, “Jambo style.” The flagpole in front of the dining hall is the site of daily flag ceremonies. During the winter months, the dining hall is used for cold-weather camping. The Old Commissary is one of the oldest camp buildings. Originally donated by Caterpillar Inc., the large wooden shed was moved into the camp from another location to serve as camp supply building and trading post. Later, a quartermaster building was built on to the original structure. Following more construction elsewhere in camp during the 1970s, the trading post was converted into the camp office, the commissary into a health lodge and office space, and the quartermaster building into the Wilderness Training Center, a conference room used for training sessions. This facility is also used for lodging during the winter months. In 2007, Ingersoll opened a 50-foot tall climbing tower. It features 3 walls of varying difficulty, a giant’s ladder, and a 350-foot zipline to the ground below. The Climbing merit badge is instructed here during summer resident camp. Finished in 2008, the lakefront area at Lake Roberts contains a sand beach, a large dock, boat storage, and teaching space. Boating merit badges, including Rowing, Canoeing, and Small Boat Sailing are taught here during the summer months. Across the lake, the Fish Shack contains teaching space for the Fishing and Fly Fishing merit badges, as well as facilities for cleaning and preparing fish. 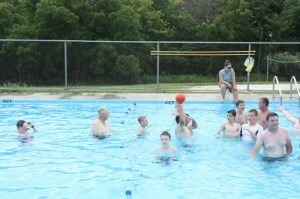 Other Aquatics merit badges are taught at the pool. 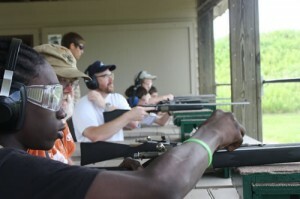 There are also many other program areas at Ingersoll, including a shooting range that offers .22 caliber rifles, archery, and 20 gauge shotgun shooting. Scoutcraft offers many programs and merit badges helping the visiting scouts with their outdoor skills, scouting lore, and many forms of time-cherished crafts such as woodcarving and basketry. Ecology and Conservation, often referred to as Eco-Con, offers the nature and science merit badges and programs, and hosts many competitions unique to Ingersoll, such a Treemail, a series of challenges that scouts can undertake as individuals and groups to earn points for their troops. The troop that advances the farthest by the end of the week is recognized at the closing campfire. Ingersoll also offers a cooking program, where scouts become familiar with outdoor cookware and creative ways to prepare different foods while camping. Ingersoll also offers several Camp Wilderness outposts. In the morning, a troop may choose to go to the Paul Bunyan outpost instead of the normal breakfast at the Dining Hall. Paul Bunyan is an interpretive program based on an old-fashioned Minnesota logger camp, complete with staff in period attire, serving pancakes and sausage for breakfast, and offering such activities as tomahawk throwing, kubb, loggerball, crosscut saws, and spar pole climbing. The lunch activity is a trip down to Crawdad Landing on the Cedar Creek, where scouts eat a sack lunch and spend an hour sliding down a giant tarp into the creek, often getting extremely muddy in the process. Enduring as one of Ingersoll’s most popular attractions, Horseshoe Bend is the dinner outpost and interpretive program based on a cantina in the Old West. 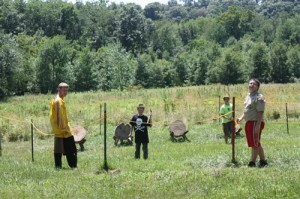 The program includes horseshoes, tomahawk throwing, a blacksmith forge, lassoing “cattle” and even a “bucking bronco”. Much of the food is prepared over an open fire or in dutch ovens. Dessert consists of IBC Root Beer, kettle corn, and fresh, homemade ice cream, hand-cranked by volunteering scouts. Campsites at Ingersoll are divided into three ridges: North, South, and West. North ridge contains the most developed campsites, with platform tents and cots for lodging in the high, shady woods. South Ridge contains a mix of developed and primitive campsites in a lower, forested area. West Ridge campsites are all primitive and in flat, open areas. There are two large shower facilities shared by all campsites. Every campsite has its own latrine and water spigot. In the late 1950s, the Creve Couer Council faced growing problems with its existing resident camp, Camp Wokanda. Its facilities, mostly constructed in the 1920s and 1930s, were inadequate, and it was being encroached upon by the urban sprawl of nearby Peoria. In 1960 it was decided that a new camp should be constructed, far enough from civilization that boys’ survival skills could be put to the test. Other criteria for this new camp included a lake, a river, and enough space to allow campsites privacy and community. Many sites were considered, but eventually a 600-acre plot located 36 miles east of Peoria on Illinois Route 116 near London Mills was chosen for its rolling hills, meadows, and natural woodlands, as well as its river access and location within the famous Spoon River country. The site also contained a brick ranch-style house far from the main road, considered perfect for housing a camp ranger. With a site decided, the Creve Couer Council then focused its efforts on paying for the land. At $60,000 (roughly $428,000 today), finding the money proved to be difficult. Hoping to find one donor who could cover the whole cost, an appeal was made to William P. Ingersoll, a philanthropist from nearby Canton, Illinois. After confirming for himself the validity of the request, Ingersoll agreed to pay for the entire property on the condition that his donation remain anonymous. So it was that in 1963, Wilderness Camp officially opened for its first camping season. Over the next decade, Ingersoll continued to anonymously fund the camp, allowing for the construction of new buildings and the acquisition of surrounding land, eventually bringing the camp to its current 960 acres. Following Ingersoll’s death in 1972, the camp was renamed Ingersoll Scout Reservation in his honor with the permission of his remaining family. Page written by Andrew Fishel.